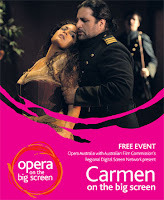 For the first time, Sydney Opera House is doing a live broadcast of Opera Australia's production of Carmen to big screens at The Forecourt, Federation Square in Melbourne, and to eight regional theaters across Australia. 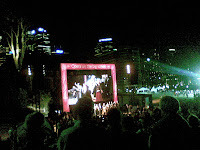 Opera on the Big Screen is open to the public, with a limit of four tickets per person. I registered online for the event, and got four wristbands in the mail, which I gave to GF and my sister. This is actually my first time to watch an opera. For one, operas are relatively more expensive compared to regular plays and concerts. Two, I know some arias and selected songs from selected operas, but I don't know if I'll be able to sit through one complete opera. (This one runs for 2 hours and fifty minutes inclucing one twenty-minute interval). Thanks to the live broadcast, I now know I can - given the right price and the right company. A short synopsis of the opera. Don Jose, a corporal of dragoons, was seduced by Carmen, a gypsy cigarette girl. She convinces him to let her escape when she was arrested for creating trouble. Later on, she manages to get him to desert the regiment and join the smugglers in the mountains. Don Jose is unhappy because Carmen is flirty and fickly, and she now has the hots for Escamillo the toreador. In the last act, Carmen goes to the arena to watch Escamillo perform. In a fit of anger and jealousy, Don Jose kills her with a knife.